This 19th century autobiography showcases the Romantic style for which Chateaubriand became known: vivid descriptions of nature and rustic life mixed with literary allusions and high rhetoric, all in the service of communicating intense, individual feeling. 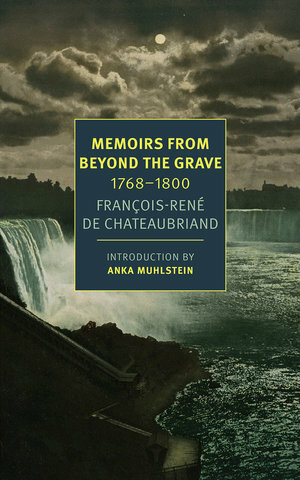 Even for the rare air of the New York Review Books Classics, François-René de Chateaubriand's Memoirs from Beyond the Grave: 1768-1800 is recherché. Most of this handsome list consists of overlooked worthies from the 20th century, or reissues of lesser-known texts by well-known 19th century authors. But Chateaubriand is either older or more obscure (or both) than most of his list-mates. French writers from Baudelaire to Proust to Roland Barthes attested to the greatness of his prose style. To contemporary Anglophone readers, alas, his name conjures little more than the eponymous dish, a decadent cut of beef tenderloin. Such are the vagaries of posterity, as Chateaubriand himself would have appreciated. "It has been claimed that true beauty is for all time," he writes, "yes, if we are speaking of beauties of feeling and thought, but no, not beauties of style." This consummate stylist knew style's limits. And yet the engrossing memoir he left behind belies his claim: here is a book whose style still speaks, and well enough to have fashioned a life still worth speaking about. My mind instantly underwent a complete conversion. Rinaldo saw his weakness in the Mirror of Honor in Armida's gardens. I am no hero out of Tasso, but the same mirror showed me my image in the depths of an American orchard. The clash of arms and the tumult of the world resounded in my ears beneath the thatched roof of a mill, hidden in the darkness of a foreign wood. I said to myself, "Return to France," and I abruptly put an end to my travels. This event is probably no more factual than the author's meeting with Washington, but it's a charming example of the quintessentially Romantic style for which Chateaubriand became known: vivid descriptions of nature and rustic life mixed with literary allusions and high rhetoric, all in the service of communicating intense, individual feeling. The young soldier returned to Europe to join the unsuccessful counter-Revolution. Wounded in battle, he made his way to England, and survived a precarious exile there while writing the books that would eventually make his name. Chateaubriand came back to France after the rise of Napoleon and the amnesty given to exiles, but he quickly soured on the new regime. Pursuing a successful career as a writer, he traveled widely, and reentered politics with the Bourbon restoration, serving as an ambassador in various European capitals, including London. Throughout this time and afterwards, Chateaubriand composed his memoirs. He eventually sold them toward the end of his life, on the condition that they would be published after his death. Fearing no retribution or censure, the author of Memoirs from Beyond the Grave speaks frankly and he does so in an unusually immersive way. As Anka Muhlstein's helpful introduction points out, Chateaubriand "does not separate his life at the time he was writing from the period of the past he is describing." Past and present merge in the retelling, just as they do when we remember. And, just as we do when we remember, we make things up and change the past to suit our present purposes. The memoirs are, according to their translator, Alex Andriesse, "a concoction of the imagination, a composite of memory and myth." To some degree, this is true of all memoirs and, indeed, of all narratives, even ones that are supposed to be based in fact. As Hayden White pointed out many years ago, historical texts are literary artifacts. Their success or failure depends not only on what they say but how they say it, that is, on their literary technique. I was roused from my reflections by the warbling of a thrush perched on the highest branch of a birch. This magic sound brought my father's lands back before my eyes in an instant. I forgot the disasters I had only recently witnessed and, abruptly transported into the past, I saw again those fields where I so often heard the thrushes whistling. When I listened then I was sad, as I am today; but that first sadness was born of a vague desire for happiness: a privilege of the inexperienced. The sadness that I experience presently comes from the knowledge of things weighed and judged. The bird's song in the woods of Combourg spoke to me of a bliss I was sure I would attain; the same song in the park here at Montboissier reminds me of the days I have lost in pursuit of that old, elusive bliss. There is nothing more for me to learn.... Let me profit from the few moments that remain to me; let me hasten to describe my youth while I can still recall it. A sailor, leaving his enchanted island forever, writes his journal in sight of the land as it slowly slips away. It is a land that will soon be lost. This Proustian experience of sailing back into the past on the wings of the present is, however marvelous, an illusion; what the experience actually underscores (as it does in Proust) is its own impossibility. There is no going back; all paradises are lost (Chateaubriand knew Milton's epic and eventually translated it). The rapid pace of historical change and the bouleversements of the Revolution that Chateaubriand witnessed and suffered first hand — his older brother was guillotined, and his mother and sisters were imprisoned — only emphasized this. But time robs us whether the political climate is stormy or calm. Writing testifies to this loss. It may, for an interval, withstand it. But it can never provide the wholeness one might seek to regain. Despite the book's age, Chateaubriand's stance toward writing and time seems contemporary. Chateaubriand's work has had an explicit influence on contemporary writers — W.G. Sebald, for example. Still, there's no getting around the fact that Memoirs from Beyond the Grave is also a giant, baggy, old-fashioned book. (It might have been even baggier: this translation covers only the first of four parts of the standard French edition.) For the hardy or the curious, the memoirs are full of satisfying and memorable episodes: the author's recollections of his childhood homes, an awkward hunt with Louis XVI, vivid descriptions of trans-Atlantic crossings, poignant observations of indigenous tribes already enmeshed by European colonialism, the tragicomedy of life in the counter-Revolutionary army, and years down and out in London with other émigrés. The satisfaction of all of these comes from their rendering, of course, but also the pathos with which they are rendered. The author attempts the impossible, to fix in time what cannot be fixed. Then he does it again. Chateaubriand's Memoirs are a monument, it is true, with all of the ungainly pomp that comes with the monumental. But they are also a monument to the inevitability of change, which is to say, to the erasure of monuments. In a world where, as Marx put it, "all that is solid melts into air", this vain hymn to human vanity still resonates.